St. Martin's Press, 9781250058416, 352pp. Jimmy Webb’s words have been sung to his music by a rich and deep roster of pop artists, including Glen Campbell, Art Garfunkel, Frank Sinatra, Donna Summer and Linda Ronstadt. He’s the only artist ever to win Grammy Awards for music, lyrics, and orchestration, and his chart-topping career has, so far, lasted fifty years, most recently with a Kanye West rap hit and a new classical nocturne. Now, in his first memoir, Webb delivers a snapshot of his life from 1955 to 1970, from simple and sere Oklahoma to fast and fantastical Los Angeles, from the crucible of his family to the top of his longed-for profession. Webb was a preacher’s son whose father climbed off a tractor to receive his epiphany, and Jimmy, barely out of his teen age years, sank down into the driver’s seat of a Cobra to speed to Las Vegas to meet with Elvis. Classics such as “Up, Up and Away”, “By the Time I Get to Phoenix”, “Wichita Lineman”, “Galveston”, “The Worst that Could Happen”, “All I Know”, and “MacArthur Park” were all recorded by some of the most important voices in pop before Webb’s twenty-fifth birthday: he thought it was easy. The sixties were a supernova, and Webb was at their center, whipsawed from the proverbial humble beginnings into a moneyed and manic international world of beautiful women, drugs, cars and planes. That stew almost took him down—but Webb survived, his passion for music and work among his lifelines. 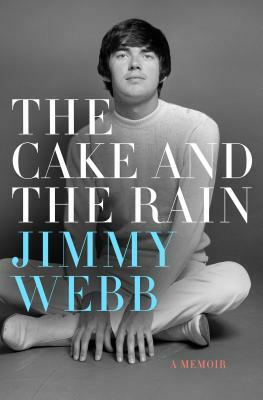 The Cake and The Rain is a surprising and unusual book: Webb’s talent as a writer and storyteller is here on every page. His book is rich with a sense of time and place, and with the voices of characters, vanished and living, famous and not, but all intimately involved with him in his youth, when life seemed nothing more than a party and Webb the eternal guest of honor. JIMMY WEBB, “America’s Songwriter”, is the author of the musician’s “bible”, TUNESMITH: INSIDE THE ART OF SONGWRITING. Webb’s songs with their complex chord structure have been recorded or performed by artists from Frank Sinatra to Carly Simon, to R.E.M. He tours extensively performing his own works and stories in the United States and around the world. He was the youngest man ever inducted into the Songwriters’ Hall of Fame and was named by Rolling Stone Magazine as one of the top fifty songwriters of all time. A father of six and grandfather of one, Webb lives with his wife, Laura Savini, in New York.